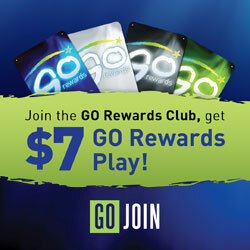 Get even more out of Indigo Sky Casino by signing up for a Go Rewards Club card. As a Go Rewards cardholder, you will receive casino perks including points toward free game play and invitations to member-only events and offers. Remember, the more you use your Go Rewards Club card while playing and participating in Indigo Sky offers, the more you’ll earn. Go Join!